Montserrat Calypso Finals 2015 | ComeSeeTv Broadcast Network ... Can you See me Now! Montserrat Calypso Finals 2015 will be live on zjb.gov.ms powered by www.comeseetv.com on Wednesday December 30th, 2015 from 8pm for only $10 USD. 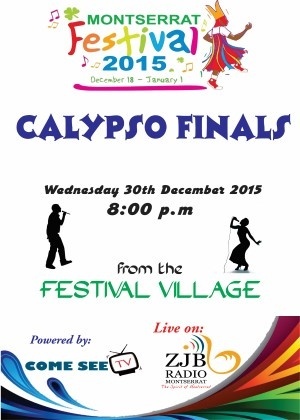 Montserrat Calypso SemiFinals 2015 will be live on http://zjb.gov.ms for only $10 USD on Wednesday December 30th, 2015 from 8 pm. You can watch it on the PPV tab on www.caribvision.tv.